Rickets is a disease that happens in young children. It happens in children who do not get enough vitamin D and calcium. It causes larger spaces inside bones, and makes them dry, like sponges. It can make the legs curve toward each other (so the knees touch) or away from each other. 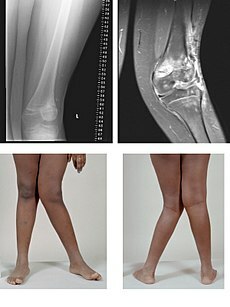 Rickets in adults is called osteomalacia. The word "rickets" comes from the Greek word rhakhis, which means "spine." People need both vitamin D and calcium to make their bones strong. Vitamin D helps the bones absorb (take up) calcium. Low vitamin D makes it hard to absorb calcium. The human body makes vitamin D3 in the skin, from cholesterol. Then the liver changes vitamin D3 into calcitriol, which sends calcium from the blood into the bones. The bones need calcium to stay strong. However, the skin will not make vitamin D3 unless enough ultraviolet light shines on it. Sunlight contains ultraviolet light, so getting enough sun is one way of getting enough D3. People need calcium for calcification. Calcification uses calcium to help make bones bigger and stronger. Low calcium makes bones delicate and easier to break. Rickets can be prevented if a person gets plenty of calcium and vitamin D.
The best way to do this is to get a lot of sunlight, and eat foods that have a lot of vitamin D and calcium in them. However, people who cannot get enough vitamin D and calcium this way can take supplements (vitamin pills that have calcium and vitamin D in them). Today, many products are "fortified" with vitamin D: the vitamin was added when the food was made. These foods include some kinds of orange juice, breakfast cereals, breads, and even bottled water. The food's label will say how much calcium it has in it. Calcium is absorbed best by the bones when it is taken in amounts of 500 – 600 grams or less. Because of this, doctors suggest eating smaller amounts of foods with calcium in them, at different times in the day, instead of all at once. There are three ways to get vitamin D: sunlight, foods, or supplements (vitamin pills that have vitamin D in them). However, many people cannot get enough vitamin D just from their diet. Breast milk may not have enough vitamin D in it to prevent rickets. Babies who are only breastfed, and not fed any other foods, may be given vitamin D drops to make sure they do not get rickets. However, this is not a significant risk if mothers and child have some exposure to sunlight. Children with dark skin are more likely to need additional vitamin D.
↑ 1.0 1.1 1.2 1.3 Cole Jr., Madison B. (2016). "Rickets." World Book Advanced. World Book. Retrieved February 22, 2016. ↑ 2.0 2.1 2.2 2.3 2.4 2.5 2.6 "Calcium and Vitamin D: What You Need to Know". National Osteoporosis Foundation. Retrieved March 5, 2016. ↑ "Rickets." Nutrition and Well-being A-Z. Ed. Delores C.S. James. New York: MacMillan Reference USA, 2004. 2 vols. ↑ 4.0 4.1 "Rickets: Risk Factors". Mayo Clinic. Mayo Foundation for Education and Research. June 1, 2013. Retrieved March 5, 2016. This page was last changed on 21 March 2016, at 00:12.